Chocolates, roses and romantic dinner dates are traditional hallmarks of Valentine’s Day. Commercially, the holiday is aimed at couples, I know, but there is no reason why it can’t be a day dedicated to a little self-focus and self-love. So, regardless of whether you’re in a relationship or have just found yourself single in the lead up to Valentine’s, you can and should treat yourself to something special on the 14th of Feb. Here are a few ideas on how to do it. Exercising self-love and mindful appreciation for where you are in life, for who you are and what you’ve achieved to date, no matter how small those achievements may seem is worth being celebrated, and it is one of the most grounding things you can do as a gift to self. For life. Of course, it’s something you can and should also do when you have that someone special to share your ups and downs with and as you adventure through life together. Indeed, you can exercise self-love and mindful appreciation as a couple as well. 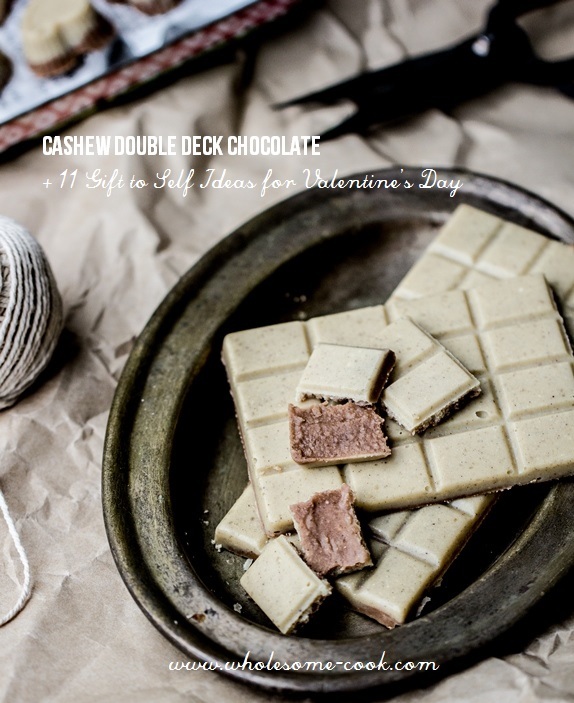 However, if you’re on your own, here are a few ideas for Valentine’s Day, apart from or in addition to a batch of the delicious Cashew Double Deck Chocolates from the Wholesome Cook book for which I have included a recipe below and which you definitely should make! 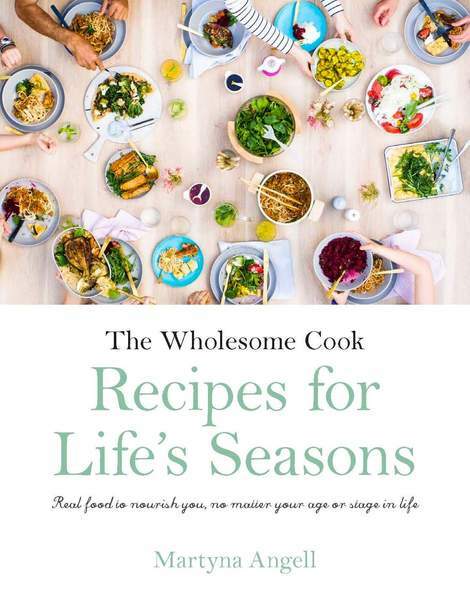 3.Eat super well on the day as a gift to your future self, but enjoy something indulgent as well – after all it’s a celebration! 5.Sign up for an hour of meditation or yoga – many studios actually offer a first free lesson so it doesn’t have to cost you anything and you mind find a new activity you’ll love! 10.Buy a riveting novel and immerse yourself in it during an evening on the couch! 11.Everything is better with my Creamy Mushroom Sauce (one of the most researched recipes around Valentine’s Day). Now, for the Cashew Double Deck Chocolate. I recommend making a double batch. Just saying. That way you will be able to share it with someone special – a loved one or friend. 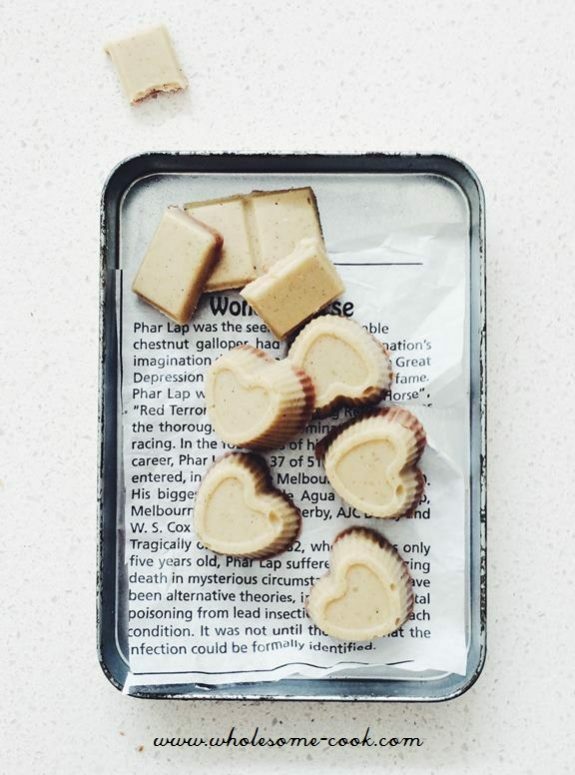 Unlike most other raw chocolate recipes, this one does not melt immediately when taken out of the fridge. If you are not too keen on the idea of dark chocolate itself, these double-deck chocolate bars, combining layers of dark and vanilla cashew paste chocolate, might just be the right thing for you. Feel free to add some crushed almonds, dried blueberries or shredded coconut to the mix as well. with boiling water, stir until just melted. cacao powder to the remaining cashew mixture and blend to combine. Store in a cool spot in the pantry or in the fridge for up to 1 month. This would be soooo delicious, I can tell already! Thank you for sharing. 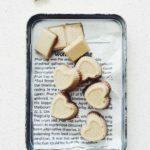 Brilliant idea to use cashews as the base instead of coconut oil!